Thanks to Melanie, creator at Violet's Buds, we have a fun summer DIY for you that is made from craft room extras. You could even make extra of these favor bags so you are ready for your next party. Enjoy! Recently I offered to make the bags for an upcoming program. I have piles of 12x12 scrapbook paper that has set unused for longer than I would like to admit. I thought this project would be a perfect way to destash my scrapbook paper, and help out a friend! The bags can easily be made in any size, and for any occasion. The bags I made were 6x9 to allow all of the swag to fit. These directions are for that size, but can be easily changed. I started with a 12x12 sheet of paper, and cut off 3" from one side. This left me with a 12x9 rectangle, plus a 3x12 strip. Set the strips of paper off to the side, you can use them later! Next take the 12x9 rectangle and fold it in half. Now you have a 6x9 rectangle to form the bag. Starting on the upper right side of the bag, I sewed a zig-zag stitch down one side, across the bottom, and up the other side. I back-stitched at the start & end to help keep the thread from coming out. When I finished sewing the bags, I took some school glue and put a dot on the start and end of the thread. Once the glue was dried, I clipped the excess thread. Finally, I took a pair of pinking shears and cut the top edge of the bag to give it the cute edge. Now its time to fill the favor bags! In an effort not to waste the 3" scrap pieces, I sewed them together to make more bags! Below is a bag I made by sewing two 3" strips together, and another bag with three 3" strips. 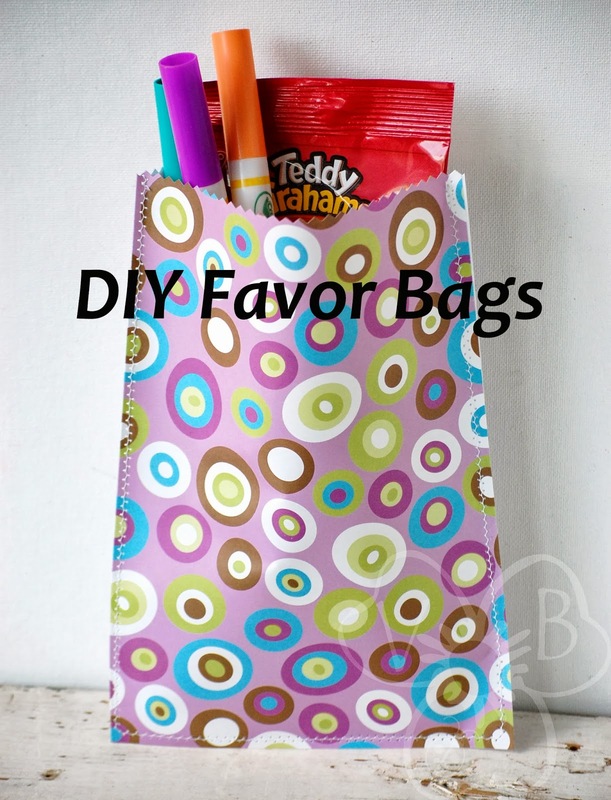 Fold those in half and you can stitch them together just like the bags above. I like the way the bags made from strips look with the different patterns. This place was very comfortable. Restrooms were decent. Coming here with my friends was an amazing experience. This is my favorite event space Chicago now, because of its excellent food, perfect lighting, vibrant atmosphere and great ventilation. Where can I buy your amazing products?? ?